For other uses, see Josh Gordon (disambiguation). Joshua Caleb Gordon (born April 13, 1991), nicknamed Flash, is an American football wide receiver for the New England Patriots of the National Football League (NFL). He played college football at Baylor and was drafted by the Cleveland Browns in the second round of the 2012 NFL Supplemental Draft. Gordon's first two NFL seasons were highly productive; in 2013, his second season, he led all players in receiving yards and was a first-team All-Pro selection. During his NFL career, Gordon has been suspended multiple times for violating the NFL's substance abuse policy. He was indefinitely suspended by the league for his fourth violation during the 2014 season, being unable to play for the next three seasons. Following a lengthy rehabilitation period, he was reinstated midway through the 2017 season. In September 2018, he was traded to the New England Patriots. In December 2018, after facing a potential "indefinite suspension" from the NFL, Gordon announced he was stepping away from football to "focus on his mental health". Gordon was born to Elaine and Herald Gordon in Houston, Texas on April 13, 1991, and has two sisters, twins named Juby and Rune. Gordon is of Haitian descent. Gordon attended Lamar High School in Houston, where he played football, basketball, and ran track. He played basketball as a sophomore. In football, he caught 20 passes for 363 yards and four touchdowns as a junior. As a senior, he was named first-team All-District 20-5A after totaling 25 receptions for 531 yards (21.2 average) and nine touchdowns. He also competed in track & field as a senior, where he ran a leg on the Lamar 4 × 100m and 4 × 200m relay squads, helping them capture the state title in both events with times of 42.69 seconds and 1:30.43 minutes, respectively. During the college recruitment period, Gordon was targeted by Baylor, Houston, Kansas, Missouri, Nebraska, and Texas Tech. According to Rivals.com, Gordon was ranked as a 3-star wide receiver while Scout.com rated him as a 2-star at the position. "Baylor Football Commitments". Rivals.com. Retrieved July 12, 2012. "2009 Baylor Football Commits". Scout.com. Retrieved July 12, 2012. "ESPN". ESPN.com. Retrieved July 12, 2012. "Scout.com Team Recruiting Rankings". Scout.com. Retrieved July 12, 2012. "2009 Team Ranking". Rivals.com. Retrieved July 12, 2012. Gordon accepted an athletic scholarship to play football for Baylor University. Although he received multiple Division I offers, his choice for Baylor was easy due to his supervised probation which required him to not leave the state of Texas. However, in October 2010, during his sophomore year, he and teammate Willie Jefferson were found asleep in a local Taco Bell drive-through lane. Police found marijuana in Jefferson's car. Jefferson, who was driving, was kicked off the team due to it being his second violation, but Gordon was only suspended. In July 2011, Gordon was suspended indefinitely by head coach Art Briles, for later failing a drug test and testing positive for marijuana. In August 2011, Gordon transferred to the University of Utah, where he sat out the 2011 season after declaring too late for the 2011 Supplemental Draft. 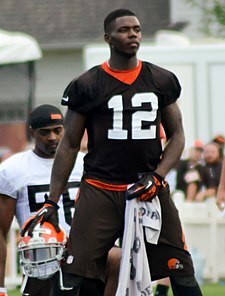 Gordon was taken in the second round of the 2012 Supplemental Draft by the Cleveland Browns. On July 16, 2012, Gordon signed a four-year, $5.3 million deal with the Browns. Gordon finished among the top rookie wide receivers in the 2012 draft class. He recorded 50 catches, 805 yards, and five touchdowns in the 2012 season. Gordon scored his first NFL touchdown against the New York Giants, where he finished with two catches for 82 yards and two touchdowns. Gordon had his first 100-yard game against the Oakland Raiders in Week 13, where he finished with six catches for 116 yards and a touchdown. Gordon had a then career-high of eight catches against the Kansas City Chiefs in Week 14. On June 7, 2013, the NFL announced that Gordon would be suspended for the first two games of the 2013 season due to violating the NFL's substance-abuse policy. In Week 12 Gordon had 237 receiving yards, and 261 the following week, the first time in NFL history that a wide receiver had back-to-back games with at least 200 receiving yards. On December 26, 2013, he was named the Cleveland Chapter PFWA Player of the Year following the season. On December 27, 2013, Gordon was voted to his first Pro Bowl selection. In just 14 games, he finished the 2013 season with a league leading 1,646 receiving yards, and was named first-team All-Pro. On July 5, 2014, Gordon was arrested for driving while impaired in Raleigh, North Carolina. On August 27, 2014, Gordon acknowledged that the NFL suspended him for one year for violating the league's substance-abuse policy. On September 19, 2014, his suspension was reduced to 10 games amidst the new NFL drug policy. Gordon was officially reinstated on November 17. On December 27, 2014, exactly one year removed from being selected into the Pro Bowl, the Browns suspended Gordon from the final game of the 2014 season due to a violation of team rules. Due to Gordon's suspensions, he only played five games in the 2014 season and caught 24 passes for 303 yards. Gordon was suspended for the entire 2015 season due to violating the league's substance abuse policy. Gordon entered the NFL's substance abuse program after pleading guilty to a driving while impaired charge in September 2014 and was prohibited from consuming alcohol during his time in the program.The suspension was for one year starting on February 3, 2015 and he was not eligible to return until the start of the 2016 season. On January 20, 2016, Gordon applied to the league for reinstatement. His request was denied in March when it was reported that he had failed another drug test. On July 25, 2016, Gordon was reinstated by the NFL. He was allowed to participate in training camp but was suspended for the first four games of the 2016 regular season. On September 29, 2016, Gordon left the Browns to enter an in-patient rehabilitation facility. He was one week away from reinstatement to the NFL, serving his previous sentence of four regular season games. In a press statement, Gordon wrote, "After careful thought and deep consideration I've decided that I need to step away from pursuing my return to the Browns and my football career to enter an in-patient rehabilitation facility. This is the right decision for me and one that I hope will enable me to gain full control of my life and continue on a path to reach my full potential as a person. I appreciate the support of the NFL, NFLPA, the Browns, my teammates, my agent and the community through this extremely challenging process." On March 1, 2017, Gordon again applied to the league for reinstatement, but was denied on May 11, 2017. On November 1, Gordon was finally reinstated, but on a conditional basis, meaning that he would be eligible to return in Week 13. He was officially activated off the Commissioner's Exempt list on November 30, 2017 for the Browns' Week 13 game against the Los Angeles Chargers. He finished the game with 85 receiving yards in a 19-10 Browns loss. On December 10, 2017, while playing the Green Bay Packers, Gordon scored his first touchdown since the 2013 season. 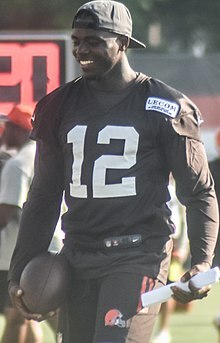 Gordon played in only one game for the Browns in 2018. On September 9, 2018, playing against the Pittsburgh Steelers. Gordon made a late-game reception for 17 yards and a touchdown resulting in a 21-21 tie following overtime. The following week the Browns indicated that they would be parting ways with Gordon after he "violated the team's trust". Initially, it was reported that the Browns finally lost patience with him after he injured his hamstring during an off-field event on September 12. The Browns had been led to believe he was shooting a promotional video for his clothing line and didn't know he was running 40s. However, it was later reported that there were multiple factors in the decision to part ways with the troubled receiver. Reportedly, the Browns were angered when he reported to practice 10 minutes late on September 13 and was "not himself." According to The Plain Dealer, the Browns feared that he was struggling to stay sober, and had done everything they believed they could do to keep him on the right path. On September 17, 2018, Gordon was traded along with a seventh-round draft pick in the 2019 NFL Draft to the New England Patriots in exchange for a 2019 fifth-round draft pick. In his first game with the Patriots, Gordon caught 2 passes for 32 yards in a 38-7 win over the Miami Dolphins. On October 4, 2018, in a game against the Indianapolis Colts, Gordon caught Tom Brady's 500th career touchdown pass. It was also Gordon's first touchdown catch as a Patriot. On October 14, 2018, against the Kansas City Chiefs, he recorded 5 receptions for 42 yards. In the next game against the Chicago Bears on October 21, he recorded 4 receptions and 100 yards, his first 100 yard game as a Patriot. On November 4, Gordon recorded 5 receptions for 130 yards and a 55-yard touchdown against the Green Bay Packers. On December 20, Gordon announced that he would step away from football to focus on his mental health. The NFL later stated that Gordon will be facing an indefinite ban for violating the terms of his conditional reinstatement under the NFL drug policy. Without Gordon, the Patriots reached Super Bowl LIII where they beat the Los Angeles Rams by a score 13-3. Gordon still received a ring for his earlier contributions to the team. ^ "Josh Gordon Pro Football Reference Profile". pro-football-reference.com. ^ Risdon, Jeff. "Josh Gordon proving he's still 'Flash' with blazing 40 time". USA Today. Retrieved December 3, 2017. ^ a b Patra, Kevin (December 20, 2018). "Patriots' Josh Gordon indefinitely suspended by NFL". NFL.com. ^ a b "Josh Gordon Bio". Baylor Bears. Retrieved November 7, 2017. ^ Dabholkar, Shweta, ed. (September 30, 2016). "Josh Gordon Substance Abuse: Net worth, Salary, Contract & Career Stats". Earn The Necklace. Retrieved November 23, 2017. ^ "Josh Gordon on Instagram: L'union Fait La Force #Ayiti #BeFree". ^ "Josh Gordon". Scout.com. Retrieved July 13, 2012. ^ "Josh Gordon". Rivals.com. Retrieved July 13, 2012. ^ Yang, Nicole. "A timeline of Josh Gordon's history with substance abuse and suspensions". Boston. ^ a b c McClain, John (July 12, 2012). "Former Baylor WR Josh Gordon hopes to leave his past behind him". Houston Chronicle. Retrieved July 13, 2012. ^ a b c "Receiver-starved Browns gamble on Josh Gordon in Supplemental Draft". Sports Illustrated. July 12, 2012. Archived from the original on July 15, 2012. Retrieved July 13, 2012. ^ Davis, Nate (July 12, 2012). "Browns select ex-Baylor WR Josh Gordon in supplemental draft". USA Today. Retrieved July 13, 2012. ^ Schefter, Adam (July 12, 2012). "Browns take Josh Gordon in Round 2". ESPN. Retrieved July 13, 2012. ^ "Browns sign supplemental rookie WR Gordon". ESPN.com. July 16, 2012. ^ "Kansas City Chiefs at Cleveland Browns - December 9th, 2012". Pro-Football-Reference.com. Retrieved November 7, 2017. ^ Kay, Joe (June 7, 2013). "Browns WR Josh Gordon suspended for 2 games". Yahoo! Sports. Retrieved June 7, 2013. ^ "Josh Gordon's consecutive 200-yard games set record". ^ "Gordon, Thomas honored by PFWA". clevelandbrowns.com. Retrieved December 26, 2013. ^ "2013 NFL Player Receiving Stats - National Football League - ESPN". ESPN.com. ^ Jones, Lindsay (July 5, 2014). "Browns wide receiver Josh Gordon arrested for DWI". USA Today. Retrieved July 7, 2014. ^ "Josh Gordon suspended 1 year". ESPN. August 26, 2014. Retrieved August 26, 2014. ^ "Browns' Josh Gordon reinstated from suspension". NFL.com. November 17, 2014. Retrieved November 17, 2014. ^ "Josh Gordon suspended by Cleveland Browns". NFL.com. December 27, 2014. Retrieved December 27, 2014. ^ Wesseling, Chris (February 3, 2015). "Browns' Josh Gordon suspended at least 1 year by NFL". NFL.com. Retrieved March 25, 2016. ^ "Josh Gordon facing 1-year ban". ESPN.com. January 25, 2015. Retrieved January 25, 2015. ^ "Josh Gordon fails another substance abuse test, faces 1-year suspension, per report". SB Nation. January 25, 2015. Retrieved January 25, 2015. ^ "NFL suspends WR Josh Gordon". ESPN. February 3, 2015. Retrieved February 3, 2015. ^ "Gordon asks Goodell to lift his indefinite ban". ESPN.com. January 20, 2016. ^ "Sources: Josh Gordon fails another NFL-administered drug test". Fox Sports. November 15, 2016. Retrieved July 19, 2016. ^ "NFL reinstates Josh Gordon from suspension on conditional basis". ESPN.com. ^ "Browns wideout Josh Gordon entering rehab facility". NFL.com. ^ "Josh Gordon applying for reinstatement from ban". NFL.com. Retrieved April 19, 2017. ^ Sessler, Marc (May 11, 2017). "NFL denies Josh Gordon's petition for reinstatement". NFL.com. ^ "Josh Gordon to be reinstated on conditional basis". NFL. Retrieved November 1, 2017. ^ "Browns activate WR Josh Gordon". ClevelandBrowns.com. November 30, 2017. ^ Sessler, Marc. "Josh Gordon on return: 'I feel free when I'm out there'". NFL. Retrieved December 4, 2017. ^ "Browns to part with Josh Gordon; source says WR broke team's 'trust'". ABC News. September 15, 2018. Retrieved September 24, 2018. ^ "Why Baker Mayfield didn't start sooner and Josh Gordon was traded: Mary Kay Cabot". cleveland.com. Retrieved September 24, 2018. ^ Shook, Nick (September 17, 2018). "Browns trade Josh Gordon to Patriots for fifth-rounder". NFL.com. Retrieved September 17, 2018. ^ NFL records, yards per game, single season. As of 2017[update], Gordon's 2013 season is #6 all-time in the category.